Designer Jacinda Martinez takes ‘playing with your food’ to a whole new level, turning common vegetables into wearable works of art. For the last six years, the Portland-based artist has dabbled in transforming vegetables into high-fashion runway-like pieces; however, it wasn’t until last December that she started showing her work in a show called “Fashion in the Raw.” From leafy chard to broccoli stalks, her handmade biodegradable pieces show off a beautiful range of texture and color, and speak to the relationship between humans and nature. Designer Jacinda Martinez takes ‘playing with your food’ to a whole new level, turning common vegetables into wearable works of art. 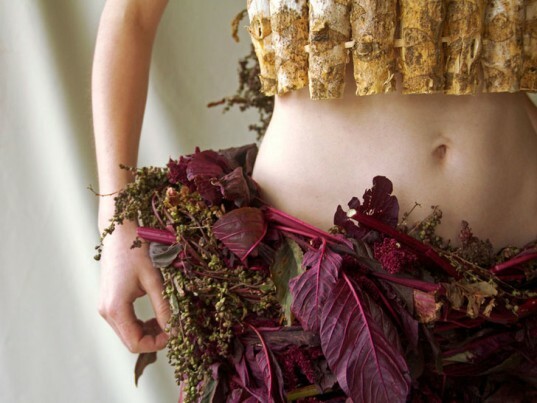 For the last six years, the Portland-based artist has dabbled in transforming vegetables into high-fashion runway-like pieces; however, it wasn’t until last December that she started showing her work in a show called "Fashion in the Raw." From leafy chard to broccoli stalks, her handmade biodegradable pieces show off a beautiful range of texture and color, and speak to the relationship between humans and nature.